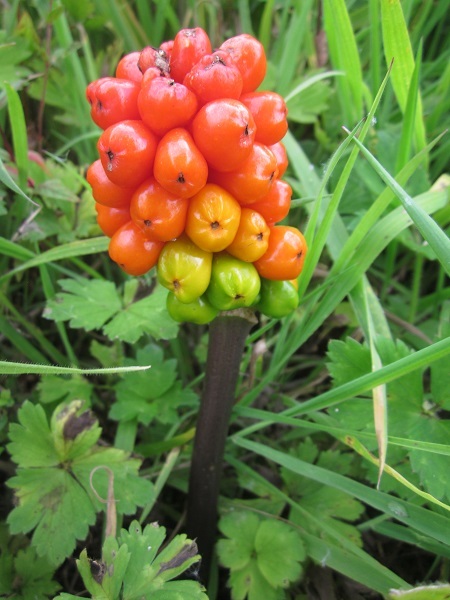 Arum italicum is a native species that can be wonderful in the right place, and which has a real talent for not putting itself there. I know a small ornamental woodland where the flowers open like a fleet of toy ships floating between the trunks for a week in May, and the leaves lie in flattened waves like the surging sea. A week later it all starts to collapse like old vegetable peelings on a compost heap. The days of glory are remarkably short (but they are glorious). Later in the year the heads of red berries are spectacular. Once you have it you will never want to be without it (and you will never be rid of it, so it all works out for the best). I try to control my urge to collect different leaf patterns. Sometimes it seems as though everybody who has a garden has selected a form and named it. They are as variable as Cyclamen and not at all challenging to grow.